Low Fuel Light On | How Many Miles Do I Have Left? When driving down the road there are a few lights that make you wish it never illuminated. Between the check engine light and the service engine soon light there is also the well-known low fuel light. The low fuel light is probably one of the most straightforward lights you can find on your vehicle, as its name and icon is displayed in a manner that there is no confusion. But, is it safe to drive with a low fuel light on? Or should the gas tank be filled immediately after the light illuminates? 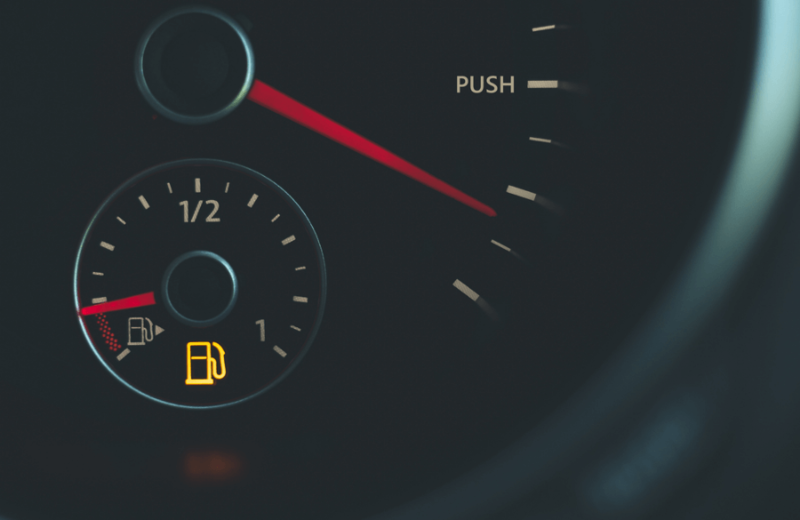 What to do when the Low fuel Light comes on? Considering the nature of the typical driver there is certain people that will be okay with allowing the low fuel light to be illuminated for miles after it comes on. The most appropriate response to this light illuminating is to go to the nearest gas station and fill your vehicle with gas. Though this may sound like a no-brainer there are some out there that will simply wait until the car can no longer operate, or right before the vehicle isn’t able to start up without a struggle. Is it Safe to drive with the low fuel light illuminated? 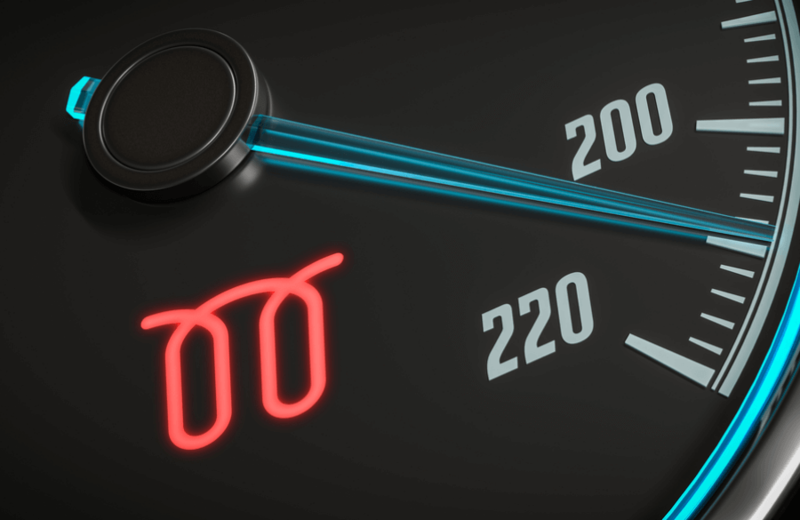 While driving with the low fuel light on is not necessarily “dangerous”, it is heavily advised against as the internal damage it could cause to the car is a thing to consider. When you have a gas tank showing low fuel, and you are continually driving your vehicle you may notice a stutter or spur which may cause your vehicle to buck. At this point you know for a fact it’s time to get to a gas station to make sure there is fuel put back into your tank. If your gas tank ends up emptying completely you risk major damage to your fuel pump, as the pump will attempt to take in fuel that isn’t there and can cause the fuel pump to burn itself out. 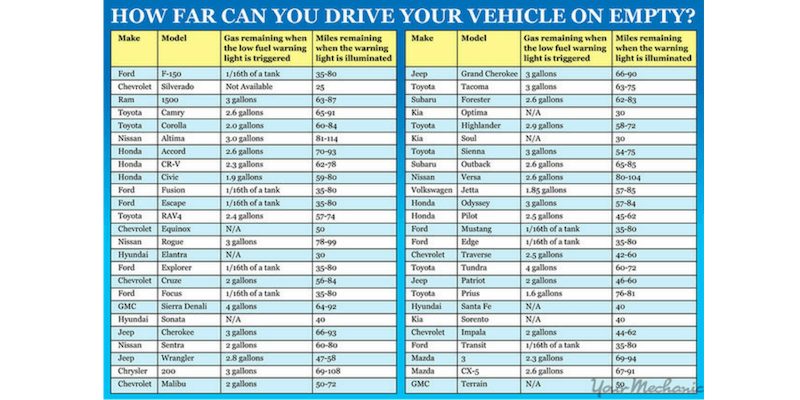 What to do if your low fuel light illuminates on the parkway? If you do find yourself running into the situation where you are unable to get off the exit, turning off the air or heat in your car and rolling up the windows will allow for less gas consumption to hopefully make it to a gas station in time. If you know you can’t make it to an exit the next best step would be to contact your emergency roadside assistance provider –give our Ultimate® Savers Club a look, it comes with anytime roadside assistance — to dispatch a truck driver with a gas canister to your location. Be advised, requiring roadside fuel delivery is not a cheap service to be provided. Some solutions to help you in the event of running out of gas while driving is to have a gas container in your vehicle, this way if you break down in walking distance you can always fill up and come back. NEVER drive around with a gas canister filled with gas, though, as the risk of a spark or flame is too great in a car. The other is to count the miles your vehicle is supposed to hold per full tank and compare that to the dial on your car. If it doesn’t line up accurately then you know there is an issue either with the tank, the information found about full tank size or the numbers themselves.